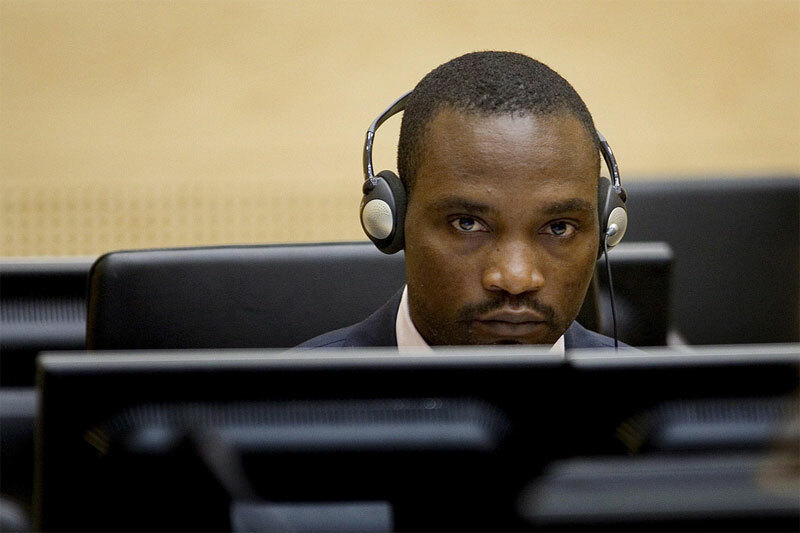 ICC indictee Germain Katanga during his trial at The Hague. This Friday, Germain Katanga has the ambiguous honour of receiving the third ever judgement from the International Criminal Court (ICC). It comes a decade after Joseph Kabila outsourced his backyard of crime to international prosecutors. The Democratic Republic of Congo (DRC) seemed to be the perfect case file for the newly established court that prosecutes genocidaires, war criminals and criminals against humanity. But the trials in The Hague show the opposite. Congo became the ICC’s Pandora’s Box. “Africa has the shape of a gun, and Congo is its trigger.” An ambitious French human rights lawyer cited Frantz Fanon, while striding through the crisp hallways of the ICC. His chief, Luis Moreno Ocampo, had just announced the start of a criminal inquiry into human rights violations in Ituri. It was Wednesday, 23 June 2004; roughly one year after the Argentinean prosecutor took his oath in The Hague. The troubled Congolese province had been on his radar ever since. Just like Iraq, Afghanistan and Colombia. But for the latest international justice experiment, Congo appeared to be a convenient and feasible pick. In the year before Ocampo set up his Office of The Prosecutor (OTP), 499 ‘communications’ had already been sent to PO Box 19519, the ICC’s fictive address since 1 July 2002. Only six complaints related to Ituri were deposited there, but nonetheless, the isolated region fitted the main selection criteria. On or after July 2002, in a battle for control over the region between at least six militias, some 5,000 civilians were massacred, villages pillaged and women raped. The court’s fiercest critics would not obstruct a judicial intervention in the Congolese ‘bush’ like they obviously would in Iraq. There was no national resistance either. On the contrary. In March 2004, Joseph Kabila had eagerly accepted Ocampo’s invitation to outsource the well-reported crimes to the war crimes prosecutor. The Congolese President undoubtedly saw an open door through which he could send a handful of warlords to The Netherlands. Besides excluding the recalcitrant Iturians from power sharing, Kabila was sure Kinshasa would linger in impunity. He would merely assist the ICC – a tactic he copy-pasted from Uganda’s President Yoweri Museveni. July 2004. Kabila’s strategy worked. Serge Brammertz – the then Belgian Deputy Prosecutor in charge of investigations – told the US embassy in Kinshasa that his probe ought not “derail” Congo’s delicate peace process. And indeed, throughout their first field mission to Bunia in September 2004, investigators heard gunshots in the regional capital. Bunians greeted them with suspicion, unsure what and who these foreigners were after. Roadblocks prevented them from leaving the city to visit crime scenes and potential witnesses. Some four months later, on 10 January 2005, the Congolese army appointed a number of Iturian ex-combatants to serve as generals. Former rivals Bosco Ntaganda and Germain Katanga were among those who received this ‘promotion’, to the disgust of late Human Rights Watch researcher and historian Alison Des Forces, who said “the government needs to take these warlords to court.” She was surprised by the wave of arrests in late February of eight Iturian warlords, including Katanga.